A representation of the Bottle Conjurer from an English broadside dated 1748-49. Perhaps the most gigantic hoax ever perpetrated was that known to history as the Great Bottle Hoax. At the New Theatre in the Haymarket, on Monday next, the 16th instant, to be seen, a person who performs the several most surprising things following, viz. first, he takes a common walking-cane from any of the spectators, and thereon plays the music of every instrument now in use, and likewise sings to surprising perfection. 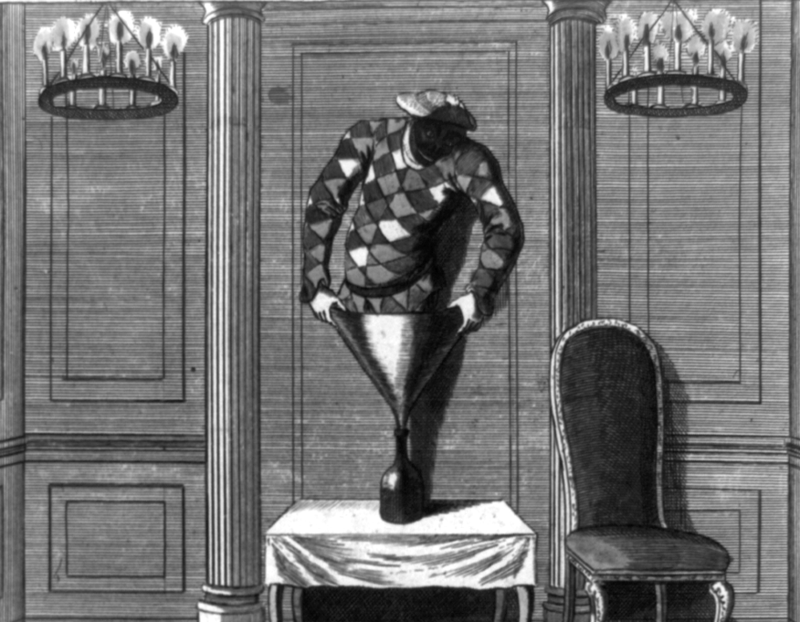 Secondly, he presents you with a common wine bottle, which any of the spectators may first examine; this bottle is placed on a table in the middle of the stage, and he (without any equivocation) goes into it in sight of all the spectators, and sings in it; during his stay in the bottle any person may handle it, and see plainly that it does not exceed a common tavern bottle. These performances have been seen by most of the crowned Heads of Asia, Africa, and Europe, and never appeared public anywhere but one: but will wait on any at their Houses, and perform as above for five Pounds each time. A proper guard is appointed to prevent disorder. The public rose to the bait like a huge gudgeon. The duke’s wildest expectations were more than realized. For days all London was talking of the man who was going to jump into a quart bottle. On the appointed night the theatre was crowded to suffocation. Every box, every seal in the pit and in the gallery, was taken. Standing-room was at a premium. The appointed hour came, and still there was no sign of the expected performance; not even a fiddle had been provided lo keep the audience in good humor. Evidence of impatience had already been manifested. Now the vast audience burst into groans, catcalls, and other cries, emphasized by the pounding of canes and stamping of feet. At last a person appeared on the stage. With bows and scrapes and profuse apologies he protested that if the performer did not appear within a quarter of an hour the money would be refunded at the doors. There were more groans and hisses. A wag in the pit shouted that if the ladies and gentlemen would give double price he would crawl into a pint bottle. This sally restored good humor for the nonce. But scarcely had the quarter of an hour elapsed, when a gentleman in one of the boxes seized a lighted candle and threw it on the stage. It was the signal for a general outbreak. The mob rose en masse, tore up the seats and benches, and proceeded to demolish everything within reach. Ladies shrieked, their escorts fought for an exit through the infuriated crowd. Such were the hurry and scramble that wigs, hats, cloaks, and dresses were left behind and lost. Meanwhile, the building had been almost gutted. Everything portable was carried into the street and made into a mighty bonfire, over which the curtain, torn from its hangings and hoisted upon a pole, was waved by way of a flag. The box-receipts were made away with. […] All attempts failed to discover the origin of the hoax, and not until many years after did the secret leak out. Meanwhile the wits of the town would not lei the matter drop. They issued pamphlets ridiculing the gullibility of the public; they printed humorous explanations of the conjurer’s failure to appear; they taxed their brains in the effort to produce advertisements of performances as outrageously impossible as the now famous bottle trick. Another advertiser announced that he would jump down his own throat, another offered to change himself into a rattle, another to shoot himself with two pistols, “the first shot to be directed through his abdomen to which will be added another through his brain, the whole to conclude with staggering convulsions, grinning, etc., in a manner never before publicly attempted.” And so on, and so on. Money seems to have been as plentiful as wit in those days, and those who had money were glad to throw it away to see their wit in print. The newspapers were probably the only gainers by the hoax. At last the excitement, having continued far beyond the traditional nine days, burned itself out, and the public mind, as it ever must, turned to other things.